I am in lust with this car. The free practice video was super too. I would love to drive like that! SILVERSTONE, September 12, 2010 - Peter Dumbreck and Tom Coronel finished in seventh place in today’s Autosport 1000 KM of Silverstone, the final round of the 2010 Le Mans Series season. 2010 Spyker Squadron Silverstone LMS Race Day from Spyker Squadron on Vimeo. On the opening lap Dumbreck lost a few places but as the race progressed the car picked up the pace and showed its reliability once more. There was contact with an LMP car twice and in the heat of a battle between Coronel and Jean Alesi the two briefly went off. But the car kept going and gradually moved up towards the front of the strong GT2 category. In his final stint Dumbreck pushed hard to keep the BMW Team Schnitzer car behind him. With Spyker Squadron eventually finishing one place ahead of the BMW it also means that Spyker has taken third in the constructors championship, ahead of BMW, Aston Martin and Lamborghini. 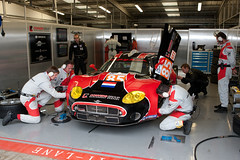 Finishing at Silverstone also meant Spyker Squadron finished all races this season, including the 24 Hours of Le Mans. The Spyker C8 Laviolette GT2R finished all races it took part in since the 1000 KM of the Nürburgring in August of 2009. Peter van Erp, Managing Director: “A seventh place finish. Eventually we have had a good weekend. In the practice sessions, qualifying and warm-up we were right up there. The start of the race was somewhat disappointing as we did not have the pace of the other teams, but we managed to get back during the race. It wasn’t an easy season for us. Fortunately we had more speed and more reliability than we had last year, no race excluded. Due to the increased competition a higher classification at some events was simply not possible. My compliments to the team and to the drivers, who managed to get the best out of themselves and out of the car. Special thanks to the sponsors and partners of Spyker Squadron and of course the management in Zeewolde! Me too. But I doubt I can actually get into the car. The free practice video was super too. Hearing that people had problems downloading the pictures from flickr.com we've changed some settings. Those that had problems (probably due to not having a flickr account) please let me know if the problem is solved.